Giant's Run is the northern region of Eastmarch. 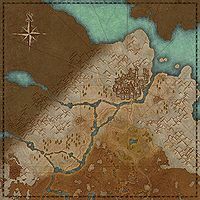 It contains the capital city of Windhelm to the north, along with the Cradlecrush and Morvunskar forts to the west and Lower Yorgrim and Kynesgrove to the east and south, respectively. The Giant's Run Dolmen lies northwest of Fort Morvunskar to the west. The south is bordered by Frostwater Tundra and Icewind Peaks. ​ Giant-Friend 5 Kill Lob the Cleaver and help the Giants at the Cradlecrush Arena. This page was last modified on 3 March 2019, at 20:51.